To me, one of the most unique things about Cape Coral is the canal system upon which the city is built. 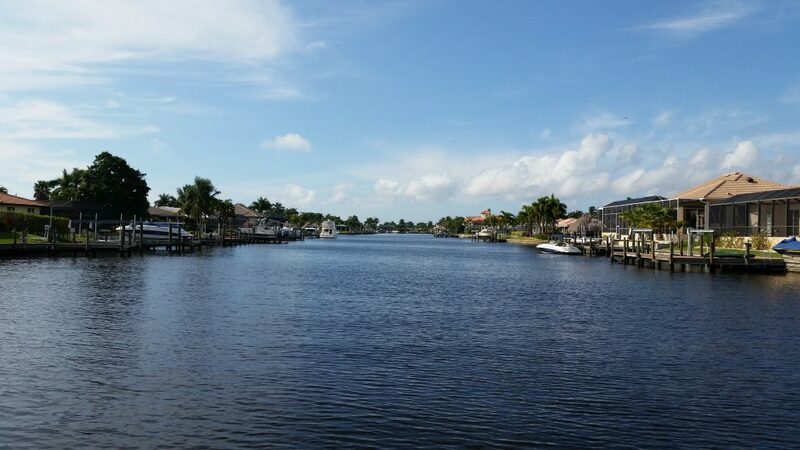 Cape Coral, sometimes called the “Waterfront Wonderland,” has 400 miles of navigable waterways—more than any other city in the world. Imagine going out into your backyard, getting in your boat, and traveling to a restaurant, a friend’s house, or just exploring the area. On a recent Sunday afternoon, when the Gulf seas were a bit too high for the timid, I spent about 3 ½ hours just trolling through the canals. It is so enjoyable and relaxing to motor through the waterways enjoying a part of the Cape that not everyone gets to see. Given that it was the holiday season, many people had their backyards and docks decorated for Christmas. It was nice to see this side of things and made me wish it were night time so that I could have enjoyed the lights, too. Many residents were outside doing yard work or just relaxing on their docks. Everyone had time for a friendly wave or a “How are you today?” This is really a chance to enjoy the much slower pace of life that is available here. Of course, the canals offer the opportunity to travel to other places in the area and to participate in other activities as well. More on that in future posts!